A man would be well advised not to be caught between Capa Barsavi and The Grey King. Even such a master of the sword as the Thorn of Camorr. As for Locke Lamora . . . I really enjoyed Lynch’s writing style and the way he built the characters and the world they lived in. I enjoyed getting to know Camorr, the town in which the book is set, and how life worked there. 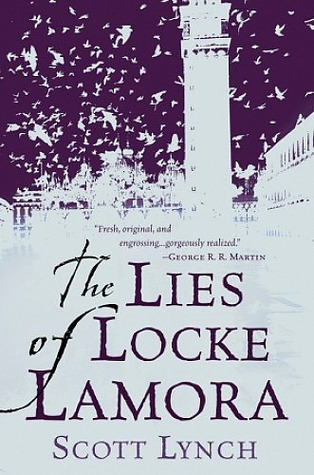 Locke Lamora is a strong character which I think has been developed really well. This is quite possibly the first book I have read which focuses on thieves and I really enjoyed the mischievousness of the characters and the banter that goes on between them. I did think it started a little slowly – just the first 20-30 pages perhaps but then all of a sudden I was sucked in and I can’t say at what point or why. I just was! This book just got better and better as I read! This books tells the story of orphan boy Locke Lamora, who is taken under the wing of a “priest” who in reality is the garrista (leader) of the band of thieves known as The Gentleman Bastards. These are not just ordinary thieves though – they are confidence men and play the long game. And they are good at it! The narrative switches around a little, detailing both Locke Lamora's childhood when he first becomes a member of the Gentleman Bastards, and him grown up as their leader. At first I thought this was going to make for a complicated read but I soon got in to the flow of things and I really enjoyed it. This style also fleshed out the characters allowing us to get to know them better. One of my favourite parts was the women’s shark fighting contests in the first quarter of the book. I also loved the fact that there were floating trees in the canals – random I know! I found it hilarious reading about young Locke Lamora going to see the Capa on the back of a Gentled goat because he had a hang over. This is just one example of humour being included throughout the book which I really liked. The book finished in the exact opposite way to which I thought the book started – those last 100 pages flew by and was action-packed to say the least. This book was a great start to the series. I am currently reading the sequel, Red Seas Under Red Skies, which I will review and post on here once I'm finished.